Ensure that your faucet and sink installation is done properly - trust the experts at AVS Plumbing & Heating. If you’re like most, your kitchen is one of the most heavily used rooms in your home. You like cabinets, counter space and appliances that can handle the demands of your family. You also like stylish finishes. And most importantly, you need plumbing that is leak-free and reliable. 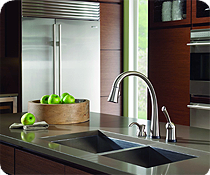 AVS Plumbing & Heating carries kitchen sinks and faucets from the best manufacturers in the U.S. including Delta, Kohler and Moen. Each manufacturer has dozens of styles to choose from – contemporary, classic, and tradition. All uniquely styled, all with today’s latest technology. Whether you need emergency repair service on your kitchen faucet, or are planning a kitchen remodel, trust the licensed professionals at AVS Plumbing & Heating to service and install your kitchen sink or faucet properly. New styles and innovations are a constant when it comes to bathroom fixtures. Manufacturers like Kohler, Moen and Delta introduce new designs to meet the demands of style-savvy consumers frequently. Browse their websites for the styles that meet your needs, then call AVS Plumbing & Heating for installation. Today’s trend is turning your bathroom into a spa-like environment. AVS Plumbing & Heating can help you tranform your bathroom into the most relaxing room in your house with high quality products from top manufacturers like Moen. See today’s bathroom faucet trends in Moen’s video below. 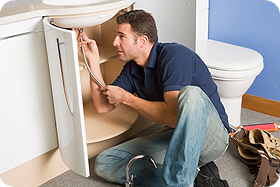 Whether it’s a small repair or a major bathroom renovation, AVS Plumbing & Heating has the experienced and licensed experts to hand it. We can recommend the right products to meet your family’s needs, and install them with care. AVS Plumbing & Heating services Howard County and Carroll County in Maryland. To find out more about kitchen and bathroom fixture installation and plumbing services, contact us today at 410-442-2221, or click the button below to schedule service.